Last Saturday we drove a couple hours north of us to meet some family on my Dad’s side. But, before that, I got a phone call earlier in the week from my Dad’s cousin. 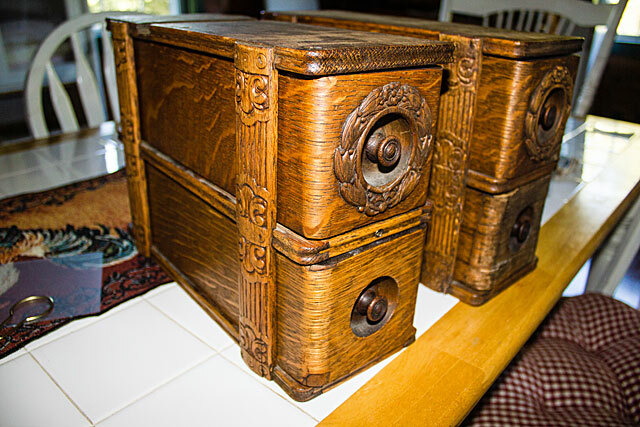 They are moving further north, back to Ohio where their children and family currently live and she had some items that she thought I would enjoy and that would be perfect for the farmhouse. 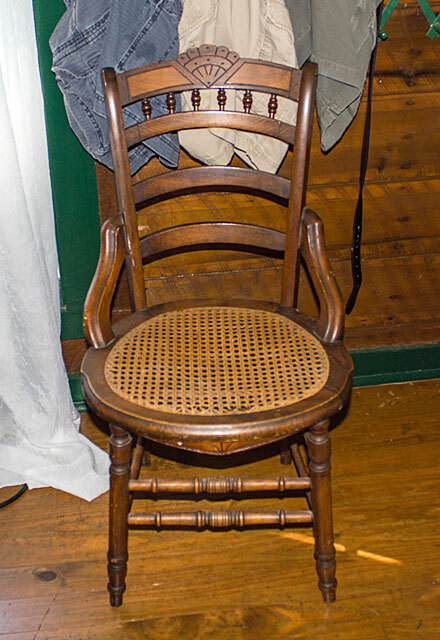 That was the last year the Mason Company made treadle sewing machines before selling the company to the Domestic Sewing Machine Company the same year. What’s really cool about this machine (Florence Rotary) is that we picked it up in Florence, Kentucky where my Dad’s cousin currently lives and the manufacturer of these machines was based in Cleveland, Ohio where my Dad was born and raised. Pretty cool, huh? Or am I the only one that thinks the correlation is pretty awesome! Since it actually works I guess I need to start watching some YouTube videos on how to work it. I have no idea what half the attachments are for or how they are used but it will be fun figuring them out! I had a wash stand in one of the guest rooms but it was dark wood and didn’t really match anything in there so I put this one in there and put the other one in our room where it matches our furniture much better. We brought home a few other goodies but we spent several hours that day getting to know each other, talking about our family history, and eating one of our faves – pizza! We thoroughly enjoyed the visit and time flew by way too fast. Before we knew it we had to load the truck and head on back to the farm to gather some eggs and check on all the animals. Fun times! Have you ever searched for something in particular only to never find it until you’ve purchased its replacement? or, when you gave up looking for it then you find it? Not too long ago, CountryBoy and I were in search of some soup bowls. Not just any soup bowls but bowls that could be put in the oven. See, we had a hankerin’ for some French Onion Soup with the melted and slightly browned cheese on top and dripping down the sides of the bowl. Yum! My brother makes THEE BEST French Onion Soup (when you can get him to make it, ha!) and even then, we live eleven hours apart so it’s not likely to get a bowl or two even if he did make it. So, we decided it was time to find a recipe, find some soup bowls and try our hand at making our own French Onion Soup. 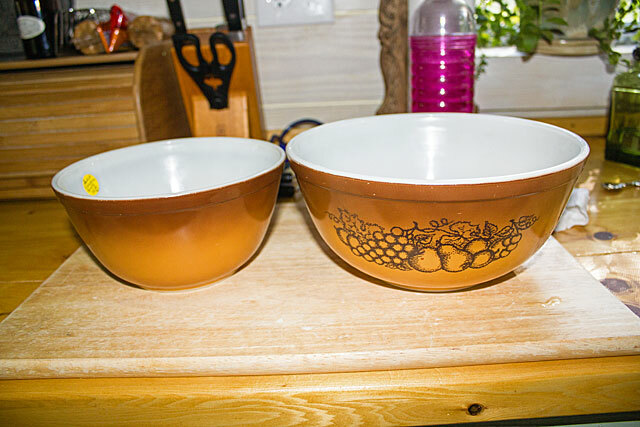 We searched and searched our local antique and vendor malls only to find one bowl here and one bowl there. We began to think that finding a ‘set’ of bowls would be impossible and, well, we pretty much gave up looking and eventually, the hankerin’ went away. Then, it happened. We went to town to do some errands the other day and we stopped in the antique/vendor mini mall on our way back home. I came across one soup bowl and decided that maybe we should buy them one at a time and eventually we would have a set if we were lucky. While the thought is running through my head I hear dishes clattering in another area of the shop. I figured it was CountryBoy so I headed towards the sound with the one soup bowl in my hand. Upon finding him, I see that he has found a set of four of the very same bowl I had in my hand AND they came with sandwich platters. How cool is that?! These are Hull dishes of which we already have several platters and serving bowls so it was an extra-special find. Now to try our hand at some French Onion Soup! Another search I recently did was online looking for dairy cows for sale nearby. I finished my search disappointed. It wasn’t that I didn’t find any, it was the realization of the cost of said dairy cows. I had heard that they were costly but I was hoping to find something that was fairly reasonable and doable for us in the near future. But, it looks like that addition to the farm will have to wait a bit. Now that the major renovations to the farmhouse are complete (for now) and the gardens are put to rest for the winter (for the most part) I am longing to have some life in the barn and the paddock. So, for now, I will concentrate on educating myself about beekeeping and will focus on doing what I can to obtain and start a hive come next Spring. Lord willing and the creek don’t rise that will be the next addition to the farm. I mentioned the garden earlier that is resting for the winter. Well, at least most of it is. This is all that’s left… a few heads of cabbage that aren’t ready for harvesting. They seem to be really slow at forming so I’m not sure if they’ll be ready before the dead of winter. Meanwhile, the other heads are fermenting away in the pantry and will, hopefully, be delicious sauerkraut in a week or so. This is my first attempt at fermenting vegetables and I’m really hoping that it turns out. Sauerkraut is an excellent source of natural probiotics to aid in digestion and immune health as well as lots of beneficial enzymes. It is best when eaten raw as cooking the kraut causes it to lose some of its nutritional benefits. I’ve never had raw, uncooked kraut but I am willing to give this batch a taste. I’m hoping it’s tasty in the raw form. I’ll let you know how it goes. It seems the phrase ‘it’s always something’ is spoken quite often ’round here on the farm. Well, the same can be said even for blogging. I was having problems getting and answering your comments in the other blog platform. I was also having problems leaving comments on other blogs that I read. While that was very frustrating the last straw was when I tried to write a blog post, using the other blog platform and a recent upgrade to Windows 10, and was unable to upload any photos. Those of you that have been reading my blog for a while know that I like to post lots of photos. Sometimes lots and lots, ha! So, it was time to find a new blogging platform. But that’s neither here nor there for y’all, but, what you WILL need to do, if you want to get notified of new blog posts, is either sign up for email notifications, Like the farm’s Facebook page or sign up to follow the blog via WordPress. You will find all these options in the column to the right. OK, now that THAT’s out of the way let’s get on with the good stuff! For the past several months we have been focused on harvesting and preserving the harvest, obtaining wood for winter and creating a pantry to store all the homegrown canned goodness. During all that, we have had health issues to deal with; heart, a severe case of poison ivy and horrible allergies that have been going on for over a month. It makes one stop and think how the true pioneers and homesteaders endured during illness. It makes me grateful for the ease of our modern homesteading lifestyle. Ease you might ask? Yes, ease. Running water, indoor toilets, electricity, washing machines, hospitals, medicine, etc, etc. Very.Grateful! We were talking about health issues. The other morning CountryBoy had a doctors appointment – just a routine checkup and some blood work drawn. After the appointment, he took me hunting. MY kind of hunting… hunting for anything for the farm and/or farmhouse. 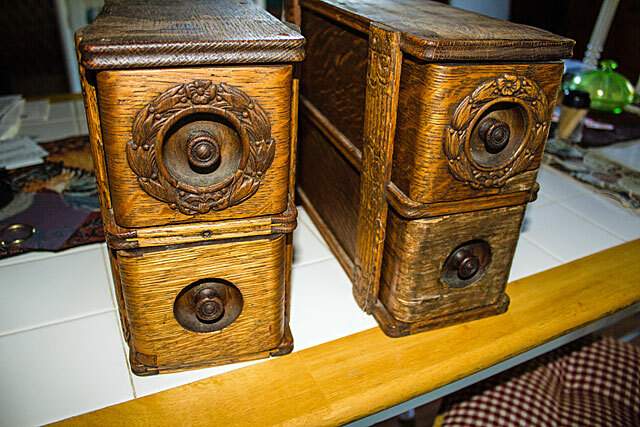 We stopped at two of our favorite local vendor and antique stores and found some awesome deals! This will be very useful to sit down and put our shoes on. Can you see the details in the wood? So pretty! I will use them in the sewing room somehow. Maybe mounted under a shelf for scissors or notions or maybe leave them as is to be placed wherever convenient. I’ll figure out their use and place once we tackle the sewing room. 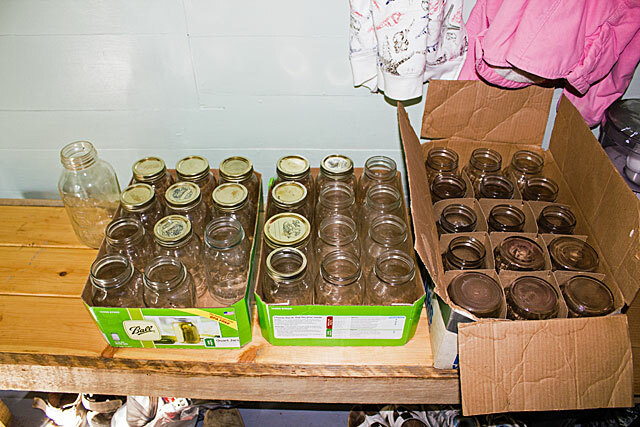 We went to another local antique shop where we scored a bunch of quart jars before we even entered the store. And I mean a bunch! There was even a 1/2 gallon jar in there. 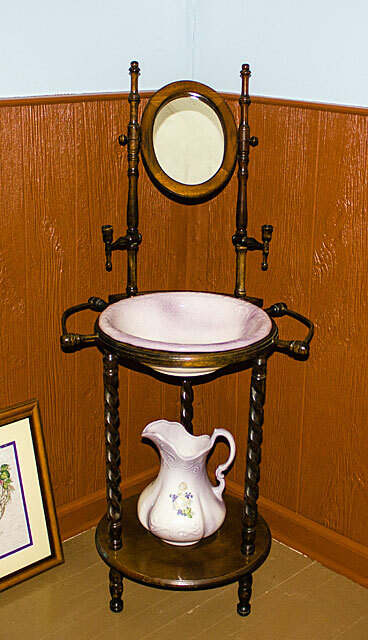 Once inside, I found the perfect, antique wash stand that was in way better condition than the others in the store and for a way better price! I love the turned wood legs and the itty, bitty candle holders! I planned on putting my Mom’s wash basin and pitcher in it but after I got home I realized that it was more of an oval shape rather than round. Luckily, the bowl and pitcher came with the stand so I will find something to put Mom’s pitcher and basin in eventually. One can never have too many Pyrex bowls! We got all that for just over $100. I think we scored! It’s always a fun time hunting for useful stuff for the farm and/or farmhouse. Thanks for stopping by! Now don’t forget to scroll back up and check out the column on the right and select how you want to get notifications of new blog posts.